Different shades of gold are created when other metal alloys are mixed with pure gold. Typically rose gold is a combination of pure gold mixed with alloys of silver, copper and cadmium. This creates a warm rose colour which became very popular in the Victorian era. 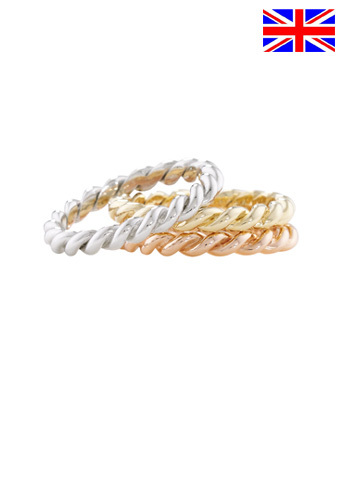 It provides a great alternative to yellow gold, and can look stunning when mixed with white and yellow gold. Typically white gold is a combination of pure gold mixed with alloys of silver, palladium, zinc, silicon and copper. The natural colour of white gold tends to be a greyish colour, so to achieve a whiter finish white gold jewellery is plated with a precious metal called rhodium. Part of the palladium group of metals, rhodium is very hard and gives white gold its bright, white colour. In the event that the rhodium plating eventually wears off it can easily be re-plated. We offer a discretionary one off, free of charge re-rhodium plating service for any piece of London Road Jewellery requiring re- plating within 2 years of purchase. Gold has been an object of desire and a symbol of wealth and success since the beginning of recorded history. Dense, shiny and imperishable, it is the most sought after of the pure metals. Associated with the wisdom of ageing, the fiftieth wedding anniversary is a ‘golden’ one. Pure gold, (24 carat), is too soft for jewellery and so other metal alloys are mixed with it to make it harder and more durable. The amount of pure gold in the metal is indicated by the carat – the higher the carat the higher the percentage of pure gold. 18 carat gold contains 75% of pure gold and has a richer colour, but is softer, and 9 carat gold contains 37.5% of pure gold but is harder.